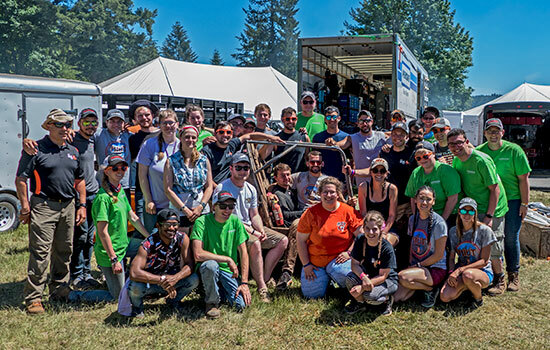 Members of RIT's Baja Racing team in Washougal, Wash., where they took first place and also were crowned season champions. Rochester Institute of Technology’s Baja Racing team won its third and final international competition of the season on Saturday, as well as the 2018 North American Championship title against hundreds of other college teams from around the world. Baja Racing is one of several collegiate design competitions sponsored by SAE where students design and build off-road race cars to compete in national and international races. About 75 RIT students are on the Baja Racing team, from each college at RIT; about 30 percent of them are female. The competition, in Washougal, Wash., near Portland, Ore., was the third and final competition in the North American Baja SAE Series. In addition to first place overall, RIT took first place in the sales presentation, design and rock crawl, and overall dynamic events. The other two series competitions were held in April in Mechanicsville, Md., (where RIT took first place) and in May in Pittsburgh, Kan., where the competition was shortened due to tornados in the area. The RIT team took third place there. About 300 collegiate teams participated, and the team with the highest cumulative points was the season winner. Of 2,700 possible points, RIT won the seasonal championship by only 2 points, over Cornell University, Gordon said. The University of Michigan placed third, about 40 points behind. The series champion receives the Mike Schmidt Memorial Award. Partially sponsored by RIT, it is named in honor of Mike Schmidt, an RIT manufacturing and mechanical engineering technology student who was killed in a car accident just prior to his graduation. Gordon said this is the third time RIT has won the Schmidt award. It also won it in the first two years it was given, in 2001 and 2002. Gordon regularly presents the Schmidt Award at the final Baja SAE Series event each year, but didn’t realize the RIT team would be this year’s recipient until he was given the results to read. Team manager Jillian Mammino, a recent mechanical engineering graduate from Greece, N.Y., said she was proud of everything the team has accomplished this year. Next year, RIT will host the Baja SAE Rochester World Challenge June 6-9, 2019.